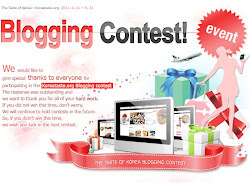 Go KoreaTaste.org and locate "AllergicAngel" under the list of bloggers. Select a post and give it a "Thumbs Up". You must open the article in order to vote. You may vote once for each post and votes may be cast on the same day. The last day to vote is May 31, 2011, Korea time. Return later to add your vote once the problem is corrected and, of course, vote for any new posts which may be added! I will keep posting and I hope you will keep reading as we write our way to Korea!